Made in United States, North and Central America, 1930. This machine was so popular that AM International, the present successor to the original manufacturer, were still selling parts and type into the 1960s. Printing machine, Multigraph, American Multigraph Co, USA, . 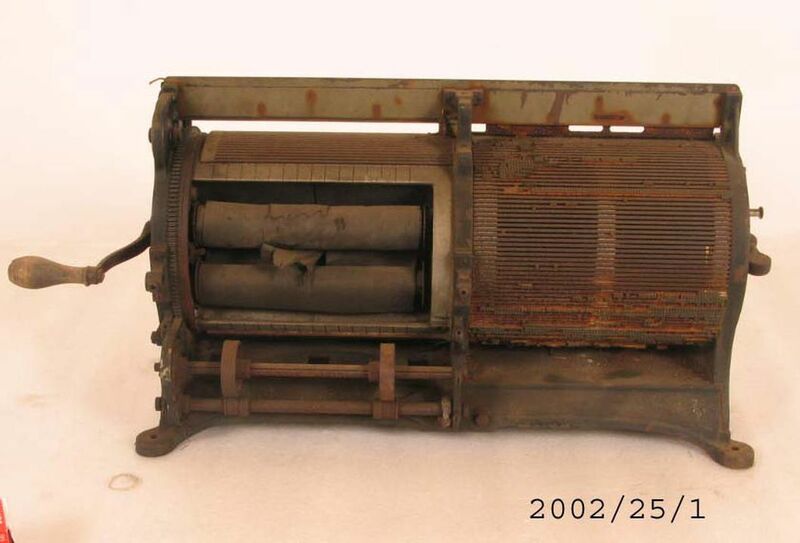 The Multigraph was a small machine with a revolving drum operated by a handle. Around a cylindrical drum printing was effected by short type with a special shaped body which slid into slots on the drum or from curved plates. The impression was made by printing ink or,for better facsimile of typewriting, through a ribbon. Designed by typewriter salesman HC Gammeter in 1902. Made by The Americal Multigraph Co. Invented 1902, parts still sold in 1965. Used for small office printing work.